I covered a bit of KBC’s story in my review of their Lift Bridge Brown. Today, I gave their entry-offering, Pick Axe Blonde, a try. It’s an American Blonde with a “kiss of the hops” and intended as an introduction brew to the marvelous world of Michigan beer and a nod to the copper mining pioneers of the area. Most likely, the lighter offering was seen as a necessity for their far northern and rural market where macro beer in cans is the traditional beverage of choice. This is a very basic light ale and, unfortunately, my pour was plagued by DMS, with a thick creamed corn nose that put me off from the initial sniff. A cloudy orange pour, there was a touch of body as it lingered in the glass, but washed down with relative tastelessness. 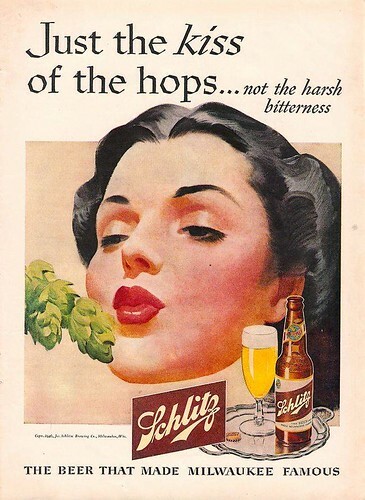 While it’s most likely intended to be rather “blah” and clean, off flavors proved to me again why craft brewers should not try to beat the big boys at their own game—you can’t out-Bud Light a Bud Light drinker—but stick to producing flavorful brews that are intentionally NOT Bud Light. Reviewed by Rings on October 18, 2010.